Lamu Island can only be reached by boat. There is an airstrip on Manda, opposite the harbour where regular daily flights arrive and depart to and from Malindi and Mombasa. The main form of transport between the other islands and along the coast is the traditional dhow. Kiwayu or Pate can be organised or even a deep-sea fishing charter. A sundown sail in the mangrove channels is the perfect end to another lazy day. Lamu is of course a Muslim community but is welcoming to all visitors. If simple courtesy and respect are shown the people are never less than gracious, helpful and friendly. Keep your beachwear for the beach and cover it with a kikoy (Kenyan sarong) when walking in the village. Security in Lamu and Shela is very good and there is virtually no theft, but please keep valuables and cash out of temptation's way at your retreat or on your person. The lingua franca of East Africa is Swahili and covers Lamu too. Arabic is spoken by many as is English. Lamu has been a destination for European tourists for almost half a century and with many of the houses being owned by Europeans there are a surprisingly high number of people who can converse in Italian, French and Spanish! Communication with the outside world from Lamu is hit and miss at times with local Cyber Cafés with reasonable rates to access Internet and e-mail services not always having good lines. However many hotels have better internet access and with most of the island and surrounding area having GSM coverage those visitors who cannot afford to be out of touch with their businesses will be able to send and receive email through their corporate networks on their cell phones. (If not then you probably aren’t that important and wont be missed anyway!) As a general rule, there is no problem to make international calls from Lamu. However, expect lack of signal inside the island and in some other places of the coast. Health Issues. There are no mandatory vaccinations for entry into Kenya, from the Europe, USA or Australasia however a yellow fever vaccination certificate may be requested if the traveler comes from areas where this illness is endemic, for example Rwanda or Congo. As well as for any other kind of trip, it is advisable to be vaccinated against the most common illnesses and you should seek the professional advice of your local travel advisory centre in good time before making your escape. a) A good preventative regime of bathing kids at sundown, applying insect repellant and dressing them into light pajamas. Adults should also apply repellant at sundown time. b) Taking the prophylactic advised by your local travel advisory centre in good time to provide cover for the start of your trip. Note that Nairobi has world class hospitals and doctors who are pioneers in the research and treatment of Malaria and other tropical illnesses. Ensure that you have ample medical evacuation cover in your Travel Insurance and in the event that the Lamu Hospital cannot fix you up you can be in Nairobi within 2 hours. DO NOT UNDERESTIMATE THE POWER OF THE SUN, which in this latitude can produce very serious burns. There is often a sea breeze in Lamu which deceives one into thinking it not as hot as it is. This combined with reflection from the water leads to frequent cases of sun-burn and dehydration even amongst hardened sun worshippers! It is advisable to drink bottled water at all times in Lamu unless the Retreat you are staying at has its own borehole and can vouch for the purity of the water. Carry bottled water with you on all your excursions and drink more than you think you need! The official Kenyan currency is the shilling or kenyan shilling (Ksh or KES). Its equivalence in USD is about 70-75 Ksh for 1 Euro (this can vary!). A Ksh subdivides in 100 cents. You are allowed to get in or out of the country with a maximum of 500.000 Ksh AND the equivalent to 5.000 US dollars. When leaving the country, the Ksh can be changed at the airport's Bank. There are countless Banks and Exchange Offices with western standards in Nairobi. In Lamu there are several Banks where it is possible to exchange traveler checks, Euros or Dollars as well as to withdraw cash using major credit cards. Mains electricity in Kenya is 220-240 volts and 50 hz. Plug sockets are usually standard UK Three pin square. Though you can find adapters for two pins classic plugs at general markets, it is worth taking travel adaptors for other more unusual plug types. Power for the whole of Lamu and Shela is provided by a generator and although generally reliable, power cuts do occur which are beyond the control of the residents. Many of the Retreats will have standby generators which will at least provide light and most cooking is done on bottled gas so generally there is little real inconvenience caused. A Valid Passport and Tourist Entrance Visa is required in order to get into Kenya. Visas can be obtained in Embassies and Consulates of Kenya all round the world and can also be obtained on arrival at Nairobi or Mombasa International Airports. For most EU nationals the cost of a permit valid for 6 months is USD$50. The Weather. 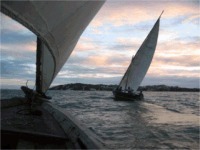 The most inclement season to visit Lamu is the beginning of the northern summer, between May and July. This is the time of the Long Rains on the Kenyan coast . Because of this, some of our Retreats may be closed to the public and use this period to perform all the necessary annual maintenance. However the weather is still warm, the days often sunny between showers and the beaches even more deserted than usual. Some might think the nicest time to visit! The rest of the year, Lamu offers slight meteorological changes, all of them enchanting and subtle. Lamu's equatorial position makes for pretty much twelve hour days and nights most of the year and no great difference between summer and winter. July and August are probably the coolest months by Lamu standards with March and April being the hottest. The European winter (November to March) is a perfect time to escape to Lamu. The sea starts to clear at the end of October and usually by mid-November the kazkazi season settles on the archipelago The kazkazi blows from the northeast from late November to March, and again the first few weeks (typically mid November to mid December) bring rains, though these are patchier and lighter than the April-May rains. From December to March the temperature rises to 35-40 Celsius and humidity to 60-70%. The pace of life has changed a little since the first visitors came to Lamu a thousand years ago, but the beaches are still open and empty and the people as charming and welcoming as ever. Escape out of your world and time into ours.